The Waffen-SS holds an outstanding position in the history of the Second World War: it was the first European volunteer army. Under the command of Supreme Command of the Army (OKH) or Suprerne Command of the Armed Forces (OKW), it fought on all European theaters of war and nearly always at the focal point: from Finland to the Peloponnesus, and from Normandy to the Caucasus. In the Second World War 910,000 soldiers were members of the Waffen-SS. Of that, 400,000 were so-called "Reichsdeutsche", or Ger­man nationals barn within the borders of the 1938 German Reich. Another 300,000 were "Volksdeutsche", Germans who lived outside these borders especially in southeastern Europe, plus approximately 200,000 foreign volunteers. Among these were Finns, Swedes, Norwegians, Danes, Estonians, Latvians, Hungarians, Croats, Bosnians, Dutchmen, Flemish, Walloons, and Frenchmen. These Europeans volunteered for the fight against Bolshevism and were exc1usively brought into action on the eastern front. During the nearly six years of war 181,000 soldiers of the Waffen-SS were killed in action and 72,000 reported missing. The majorities of missing persons were killed in action and could not be recovered, or died as prisoners of war. Very few returned after the end of the war, and frequently only after ten years or more of captivity. Many of them returned after the loss of their native countries to a divided Germany, or Austria, or other European homeland. As former members of the Waffen-SS, they were exposed to much discrimination, especially the European volunteers. Nevertheless, they achieved with mutual assistance and personal excellence well-esteemed positions in their professional lives. They were practically exc1uded, however, from positions in public service. As a new force, the Waffen-SS had a tendency to both retain old proven traditions and develop new ones. Its divisions had the same for­mation, equipment, and armament of equivalent army divisions. Differ­ences did exist, however, in the uniforms. Even before the war the SS forces called "SS-Verftigungstruppe", had tried to better itself with battle­field conditions in the area of camouflage. The proposal to introduce an earth-brown uniform was rejected by the Suprerne Command of the Armed Forces. Additionally, the new idea of a camouflage suit was un­fortunately also rejected, but accepted for use by the SS­Verftigungstruppe. Undoubtedly, it was instrumental in saving a con­siderable number of lives. 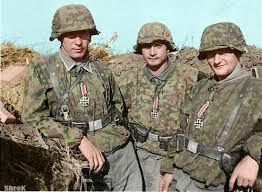 For the first time, 50 years after the end of the Second World War, the German Bundeswehr introduced a camouflage uniform in nearly the same in pattem and color, and well after US troops having the lead in this field. The best store builder by ShopFactory powers D222. All-in one store builder and eCommerce software.